I have lots of things in progress. I’m calling that one up there “Peas and Carrots”. I’ll write up a tutorial when I can breathe after market! That solid yellow in there is my new favorite color…Kona Solid in Curry. I’ve used it in everything. On the color card and online it looks horrible because it’s next to all of the bright yellows…but when you use it and put it next to other colors…perfection. Speaking of perfection…here is the Lemon Cheesecake Recipe I promised. It’s creamy and mild and super low fat (crossing fingers). Everything you make is always so pretty, so there's never any reason to be nervous. And thank you for the recipe…I'm always looking for something "low-fat" to eat!! Lol. 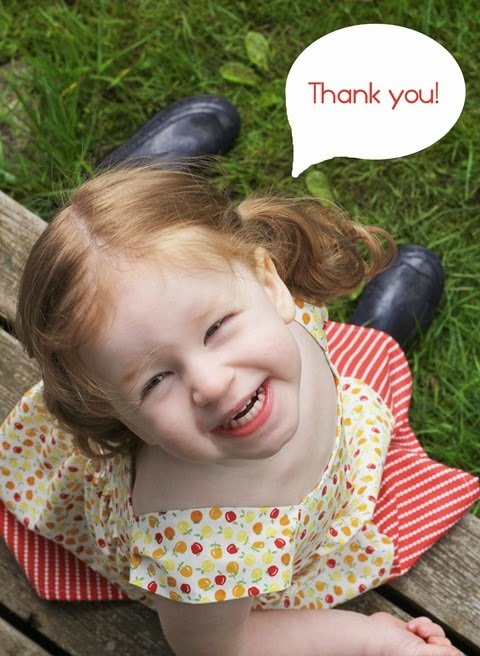 You could go into the greeting card industry with your "thank you" picture! She is a cutie. I'm sure has her "moments" though. I know my kiddos do! Oh I saw your new fabric today…and I ordered it! I'm so in love with yellow lately, too! I'm going to paint my kitchen yellow as soon as the husband leaves town…shhh! and that Sophie face….scrumptious! 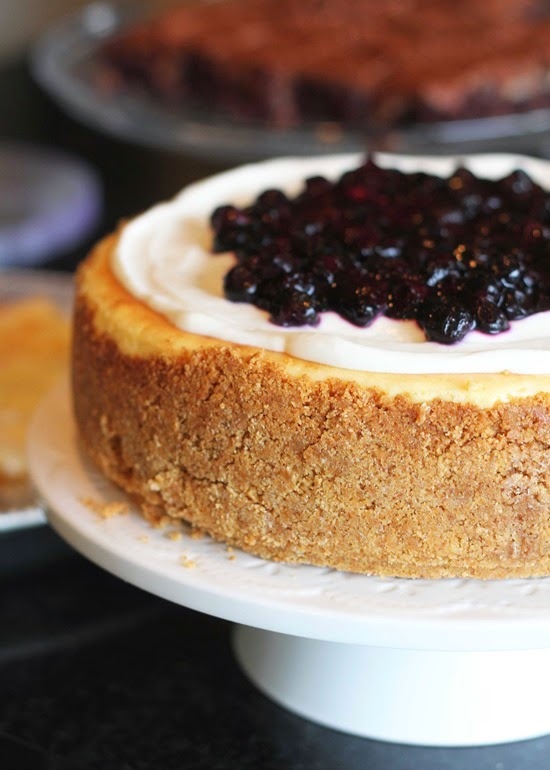 Thanks for the recipe – NOTHING better than cheesecake! How could you hesitate showing that gorgeous line! It's just beautiful. So fresh and happy. Well done you! I love that golden yellow color. I use it when I work with felt… it looks amazing with red, white, gray and aqua!!! OOoooo…your fabric choices are yummy, and I KNOW there are 0 calories in them!! Your little girl is so cute! love your stitching. I can see why that yellow is called curry. thanks for the yummy cheesecake recipe too. Oooooh that cheesecake looks delish, thank you so much for the recipe. Yellow is one of my favourite colours too – my kitchen is painted yellow and it makes it such a sunny place to be. The fabric is just charming. How pretty a new quilt would look in my blue bedroom with all those happy colors. Nice work! The colors that you used in your new project are wonderful! Love yellow! It's so bright and cherry! And the cheesecake looks scumptious! Thanks for sharing. Yum..on both the cheesecake recipe (thank you!) as well as that yellow! Looking forward to seeing Peas and Carrots! ephdra@gmail.com. I guess when I switched my Blogger profile to Google+ it has done this to me, and I can't figure out how (but I'm getting help from a great blogger) to fix it just yet. 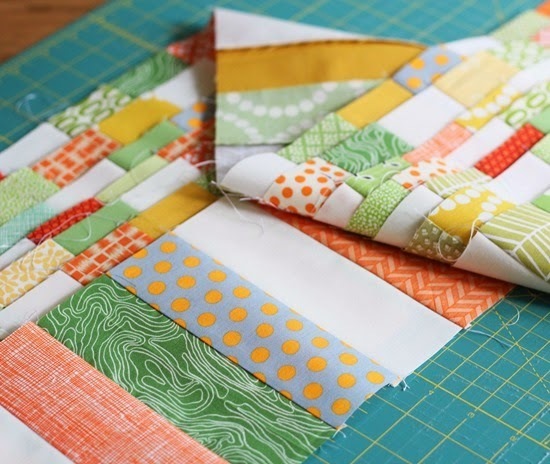 Have Angela Walters' fabric to make in your Off Track pattern I bought – will send you a pic when it's done! It's a darling new line! Wishing it was for sale right now! Love the kitchen towels with all the ruffles! And your little girls…soooo cute! ephdra(@)gmail(dot)com. I guess when I switched my Blogger profile to Google+ it has done this to me, and I can't figure out how (but I'm getting help from a great blogger) to fix it just yet. 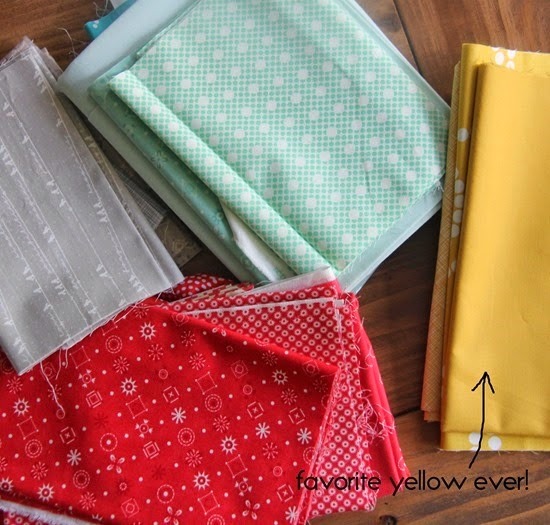 Have Angela Walters' fabric to make in your Off Track pattern I bought – will send you a pic when it's done! I have to agree…the kona solid in curry is yummy! And I'm coveting the stripe designs in your new collection. Love your little girl and the cheesecake sounds good, going to try it out on my family. I'm also practicing swirls, seeing yours I think I've got a way to go yet!